The Business Office provides leadership for the District’s financial management and for implementing the mission and goals of the District. In addition to the regulatory and auditing functions involving State reporting, pupil accounting and attendance the business office works collaboratively with the constituent districts to provide services. This is done through the Clinton County Personnel Consortium (CCPC) where the districts utilizing the service share costs for services provided. Employees can access direct deposit information, leave balances, and w-2 information online. For information prior to July 2018, please access the CIMS online portal. For information after July 2018, please access the Skyward online portal. All employee resources have been moved to the CCRESA Intranet under "Forms, Personnel". Clinton County RESA is part of a substitute system consortium called the Central Michigan Substitute System (CMSS) using EDUStaff, LLC to register and pay substitute teachers/paraprofessionals. To qualify to substitute teach in our area schools, you must have a transcript indicating completion of 60 credit hours or an associate degree from a college, university, or community college and, for substitute teaching in grades 9 to 12, is at least 22 years of age. If you will be teaching with 60+ credit hours, associate degree, OR an expired teaching certificate, you are required to apply for a 150 day permit from the Michigan Department of Education. The fee for this permit is $45.00 per school year. This fee is due after the sub permit has been submitted into the state, and you will receive an email invoice. This must be paid prior to beginning substitute teaching. Clinton County RESA's Special Education Classrooms are located 3 miles south of St. Johns and is a special needs school for children and adults ages 3 through 26. Our classrooms service students with moderate, severe and multiple impairments as well as students with autism spectrum disorders. Substituting at our classrooms can be challenging but also very rewarding. Some, but not all, of our classrooms require help in feeding, lifting, changing and toileting students. 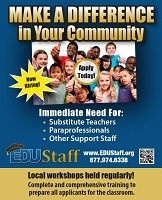 We are seeking both substitute teachers and paraprofessionals to work in our classrooms. If you are interested in subbing in our classrooms and would like more information before you sign up, please feel free to contact our building principal. Clinton County RESA employees are required every year to take several SafeSchool Modules to ensure the safety of our students and staff. Clinton County RESA provides an online electronic imaging system, CEO, for participating local districts. As a public body under the Freedom of Information Act, Clinton County RESA has developed procedures and guidelines to implement and assure compliance with FOIA. The District has also created the following summary of the specific procedures and guidelines explaining how to submit written requests to the District and how to understand the District's written responses, deposit requirements, fee calculations, and avenues for challenge and appeal.